Text by Tim B. Wride. Los Angeles County Museum of Art, Los Angeles, 2003. 64 pp., 66 black-and-white illustrations, 10¾x8¾". Donald Blumberg has been exploring photography and the manner in which photographs function as social documents, formal remnants, and aesthetic conceptual statements for close to 40 years. His work as an artist has always been fully integrated into his family life, his career as a teacher, and his political convictions. Blumberg has lived in Southern California since 1981, when he became the chairman of the Fine Arts Department and then director of the Photography Program at Otis Art Institute (1981–1990). A consummate technician, Blumberg is an artist whose signature style rests not in his selections of subject matter nor in the manner in which those subjects are portrayed but in how he uses photography to explore the visual and material properties and processes of photography itself. With more than 80 images, this book offers insights into his long career. The work of Los Angeles photographer Donald Blumberg is the subject of a major new photography exhibition at the Los Angeles County Museum of Art—LACMA—beginning September 19, 2002, and continuing through January 5, 2003. Described as a “consummate technician” and “photographer’s photographer,” Blumberg is an artist whose signature style rests not in his selections of subject matter or in how those subjects are portrayed, but in the manner in which his images address issues of the photographic. This first-ever career retrospective features more than 80 images and presents deep insight into the artist’s long career. 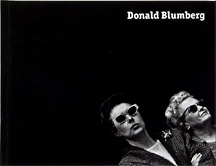 Donald Blumberg began to concentrate in earnest on a career in photography only after earning degrees in biology from Cornell University and the University of Colorado. Schooling himself on the streets of New York and engaging in critique sessions with other photographers such as Garry Winogrand, Larry Schustack, Jay Maisel, and Dave Heath, Blumberg rapidly developed his technical proficiency and conceptual sophistication. His work was included in many pivotal exhibitions, such as The Persistence of Vision, curated by the influential photographer, curator, photohistorian, and theoretician Nathan Lyons for the International Museum of Photography at the George Eastman House in 1967. Blumberg first gained national attention for his St. Patrick’s series, a body of work he developed beginning in 1965. He had become intrigued by images made by students he encountered while teaching through an anti-poverty program in New York City. He was drawn to the casual randomness of the figures, and began to pursue opportunities that allowed him to exploit this pictorial freedom within his own aesthetic. He stumbled upon the perfect situation while photographing along Fifth Avenue as worshippers began to exit St. Patrick’s Cathedral. Here, the pictures’ subjects burst from the ritualized experience of a Roman Catholic service into the urban ritual of Fifth Avenue. Arrayed against a blackness that seems to swallow light and expunge any contextual touchstones, the St. Patrick’s figures escape the constraints of scale or perspective, clustering in corners of the frame, jutting out unexpectedly from its edges. Embracing the medium as both an artist and a teacher, Blumberg enjoyed a career of more than 30 years in academia, with tenures at the State University of New York in Buffalo, California State University in San Jose, and, locally, Otis Art Institute. His teaching experience often contributed materially to his art making. This is readily seen in his “Student Portrait” series and “Daily Photograph” series, which each address formal, conceptual, and personal issues. Each aspect of the artist’s personal and professional life provided him with a platform from which to address issues purely photographic—such as chemistry and process, the manipulation of the gray scale, surface and compositional tension, and figure-ground relationships—while at the same time responding to issues of perception, such as time and motion, fictive space, psychological space, and interaction of media. Because of the artist’s propensity to explore visual terrain repeatedly over the sweep of his career, Donald Blumberg is organized conceptually rather than chronologically. This structure provides a framework within which works that address overlapping issues can interact with one another. What is remarkable about Blumberg is that his explorations result in pictures that are as visually alluring as they are conceptually sound. This survey of the broad sweep of his career reveals recurrences of key issues and concerns, each explored via a varied range of images that attack the subject from as many different perspectives as possible. The importance of Blumberg’s work lies in its reconciliation of the cognitive with the visual, the conceptual with the visceral, and the common with the exceptional. Donald Blumberg’s art is an art of integration.